We needed a shot of a server room crowded with janitorial equipment. Something that no IT Manager would ever let happen, not even if the equipment were dry and empty and if everybody “promised to be careful”. Just not gonna happen. So I got permission to shoot our server room and then reconstructed the angle in another part of the building to get the equipment at as close an angle as possible. Next I composited them together, added some suds and a puddle and opened up the right side to fit the banner design I wanted to do. This photo shoot didn’t just yield this composition. 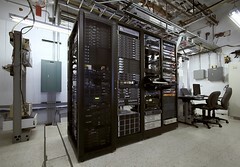 I also came out with a fantastic shot of the Server Room at work – a typical “Hero” angle. Because of the tricky lighting and that I only had 2 functional flashes with me this ended up being a composite of multiple shots.